A group of Mi'kmaq from Listiguj (formerly known as Ristigouche) in Quebec (Gaspesie region) have been blocking the entrance to a "scierie" (lumber mill) for the last few days. Strangely, I have not seen any Mi'kmaq flag on TV, in fact I don't recall any of the three Mi'kmaq communities of Quebec using any of the two known Mi'kmaq flags (see Don Healy's Native site). Even more strange is the fact that the flags I have seen are the American flag and the Mohawk [See editor's note, below] flag. One American flag seemed defaced like the Canadian flag we often see defaced with a Native Canadian/American, though I'm not sure I saw correctly. Don Healy in his terrific book on Native Americans (contact NAVA) mentions that the Mohawk flag has become common as a sign of protest throughout the Iroquois League. Though the Mi'kmaq are not part of this league (they speak an Algonquian language), perhaps this is also just a sign of protest and a sign of warning to the authorities to remind them of the Oka Mohawk crisis of 1990. 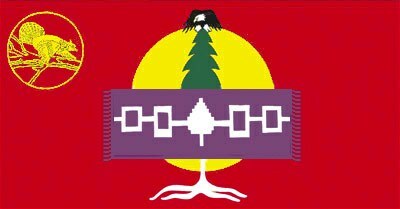 The flag is red, a central yellow disk, overlain in turn by a green tree with white roots and an eagle on the top, and a purple wampum belt. In the upper hoist, a yellow circle with an outline of a grouse(?) on it. Purple: Emblem of more important affairs of a civic nature. A covenant which represents the relationship between the Houdenosaunee, which the Mohawk Nation is a member, and the Europeans. This relationship was to be "pure, strong, and untarnished" as the silver of the chain. The tradition behind the silver chain is important as it recognizes a need for the continuous attention to "polish" the chain and keep it in a healthy condition. Together these symbolize the need for continuous dialog between the Mohawk Nation and other government to maintain the health of their relationship and to deal with current issues. Symbolizes the Great Peace and the Great Law (Kayenerenhkowa) that was established by the Five Nations of the Houdenosaunee. It is provided thus: There are now the Five Nations League Chiefs standing with joined hands in a circle...be firm so that if a tree should fall upon your joined hands, it should not separate you or weaken your hold. So shall the strength of your union be preserved.